“The Missing Cessna and the UFO: a preliminary report on the Bass Strait-King Island Affair”, Flying Saucer Review, Volume 24, No.5, March 1979, pgs. 3-5. 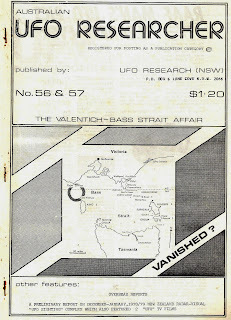 “Vanished – A report on the Valentich – Bass Strait Affair”, Australian UFO Researcher, in 3 parts (No. 56 & 57, No. 58 & 59, No. 60, January 1979 through to December, 1979). This report included details on the widespread UFO activity on the same day as the incident, the precedent for UFO activity over Cape Otway, Bass Strait and King Island, precedents for UFO-related plane disappearances or crashes. “Valentich-Bass Strait (Australia) affair”, in Ronald Story’s “The Encyclopedia of UFOs”, 1980. “Vanished? The Valentich Affair re-examined”, Flying Saucer Review, Vol. 30, No.2, 1984. See also “1978 and the RAAF” and “Frederick Valentich and Delta Sierra Juliet – Vanished?” in my lengthy on line document “UFOs Sub Rosa Down Under” at http://www.theozfiles.com/ufos_subrosa4.html and http://www.theozfiles.com/ufos_subrosa6.html respectively. The areas that feature prominently in the Valentich incident - Cape Otway (his last land call), Bass Strait (the apparent location of his disappearance) and King Island (his apparent destination), all have extensive precedents for UFO activity. 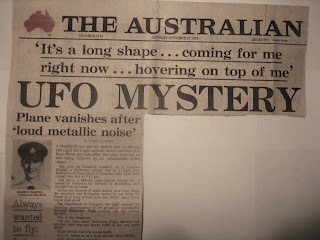 During a two month period centred around January, 1978, holiday makers, fishermen, school teachers, local police and lighthouse keepers in the Cape Otway area reported seeing UFOs. During July, 1977, local residents and the lighthouse keeper at Cape Otway, saw an inexplicable brilliant light source, that hovered out to sea for half an hour. We have seen in our history that Bass Strait figured in UFO mysteries particularly in 1920 and 1944. The Melbourne "Argus" newspaper even described many people seeing "cigar-shaped" objects flying over Bass Strait as far back as 1896. King Island's 425 square miles played host to a wave of unidentified nocturnal aerial lights for at least three months prior to Frederick Valentich's disappearance. Oval shaped lights followed cars and mystified local residents. Strange lights or flares appeared off the north of the island. One of the most spectacular close encounters with a UFO in the area, occurred at a wild and uninhabitated part of the King Island coast, near Whistler Point, just before dawn, on April 10th, 1976. "A beam of light" emanating from "a cross-shaped object" approached a duck-shooters car, in a direct line. The light display, eventually receded directly along its line of approach, ending a silent inspection, when it disappeared over the distant skyline. There is much that suggests a UFO connection but unfortunately a final answer alludes us, preventing the comfort of certainty. Despite the provocative nature of the taped conversation Valentich had with Melbourne Flight Control prior to his disappearance, that refers to a possible UFO presence, the affair still remains a mystery. The Valentich mystery is punctuated with haunting, or rather more appropriately, taunting clues, that sets one off in all sorts of conflicting directions. Many have come up with all sorts of final solutions, that vary from the bizarre to the sublime. Did a UFO abduct Valentich? Did Valentich contrive the whole affair? Did he, as many think, crash into Bass Strait, leaving no trace? Or are other prosaic explanations involved? A multitude of various lines of enquiry radiate out in all sorts of directions. Most take us away from the facts of the matter, namely that no trace of pilot or plane have yet been found. The mystery resonates in the Australian consciousness in a place reserved for more mythic episodes like the haunting fiction of "Picnic at Hanging Rock". It has inspired dramatic works like the profound and confronting play "Sky" and the bizarre and striking TV mini-series, "Locusts and Wild Honey". We must remind ourselves that a family waits for an answer that so far has never come. I hope that some day they will find that answer.